The five members of The Beatles – John Lennon, Paul McCartney, George Harrison, Stuart Sutcliffe and Pete Best – along with manager Allan Williams, his wife Beryl, her brother Barry Chang and friend Lord Woodbine, set off from the Jacaranda club in Williams' green Austin van. They stopped off in London to pick up a 10th passenger, Herr Steiner, an Austrian working in the Heaven and Hell coffee shop on Old Compton Street, who was to be the Hamburg promoter Bruno Koschmider's interpreter. They then caught the ferry from Harwich to the Netherlands. It was cramped. The van didn't even have seats; we had to sit on our amplifiers. We drove down to Harwich and got the boat to the Hook of Holland. Driving through Holland, I remember we stopped at Arnhem where all the people had parachuted out to their deaths (another little Winston Churchill trick). There were thousands of white crosses in the cemetery. The party ended up in Arnhem after Williams took a wrong turning. 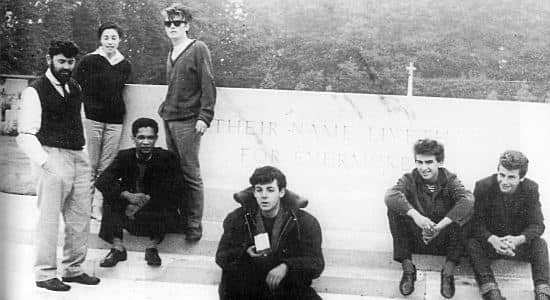 While there they were photographed at the war memorial, spent time wandering around the city, and John Lennon stole a harmonica from a local shop. At Arnhem there was time to get out and walk around and stretch our legs. We also went to see the Arnhem war memorial. There are photographs of us sitting in front of it. Seeing the war graves and all the rest of it was quite moving, to me anyway. It quietened us down a bit. I think it was the aura of the place, the peace and tranquility that came through to us. We didn't stay together as a party so while Allan went off to do what he wanted to do, we broke up and did our own thing and had a walkabout. We had time to kill so we went round the town centre and into a music shop, and when we came out they were all laughing their heads off. I said: 'What's the joke, lads? ', and John pulled out a mouth organ – he'd stolen a bloody mouth organ! I thought, 'Christ, we're never even going to get to Hamburg, we'll all be in jail.' The first time abroad and he had the audacity to rob a shop! From the Netherlands the party made its way to Hamburg, arriving in the early evening of 17 August 1960. You will notice that John is not in the Arnhem war memorial photograph. He must have taken the picture! Perhaps even then he didn’t want anything to do with war!! John was so against war that he refused to get out out of van and even look at the memorial. Barry Chang or Herr Steiner could’ve taken the picture, but it doesn’t really matter who did it. Is it true that The Beatles played for 12 hours straight in Hamburg? Never without a break, or alternating with another band, no. Take a look at the Hamburg concert dates, as they normally have an outline of how many hours played in each particular residency (though I think stage times and durations were fairly flexible). As I did the same route from Liverpool to Hamburg, stopping a little at SoHo and crossed the North Sea and then headed straight to Hamburg I can assure you that the Beatles could not arrive in time to debut in Indra on the 17th. Therefore, it is more feasible that they have left Liverpool on the 15th. No, they could’ve done it if they took the overnight ferry. If they left Liverpool early on 16th, got to Harwich by evening, set off early morning from the Hook on 17th, they could’ve got to Hamburg by early evening. Lennon’s alleged theft of a harmonica was not prompted by his meeting with Delbert McClinton since the latter event took place 22 months after the stop-off at Arnhem, where, incidentally, my father parachuted out -but not to his death, since I was born 2 years later. Today, on a Dutch talkshow an old lady who still runs a music instrument shop in Arnhem told that in the 80’s she heard the story of John stealing a mouth organ in Arnhem and realised that this had happened in her shop. She remembered some very strange looking English boys coming to her shop in the 60’s, wanting to look at some instruments, but buying nothing. Later she missed a mouth organ. She nows sells the same model as ‘The Stolen One’. The name of the shop was Bergmann Muziek and was located in the Koningsstraat in Arnhem. The shop had to close their doors in 2013.